If you have a website, then there’s no greater joy and success that you can achieve in online marketing than seeing your website rank top in search engines. Through good SEO practices and marketing strategies, higher traffic flow to your website is guaranteed. SEO and internet marketing icons can prove to be of great help in your marketing strategies. Today, we share with you this set of icons, which we hope will inspire you a great deal in your search engine optimization and online marketing campaigns. 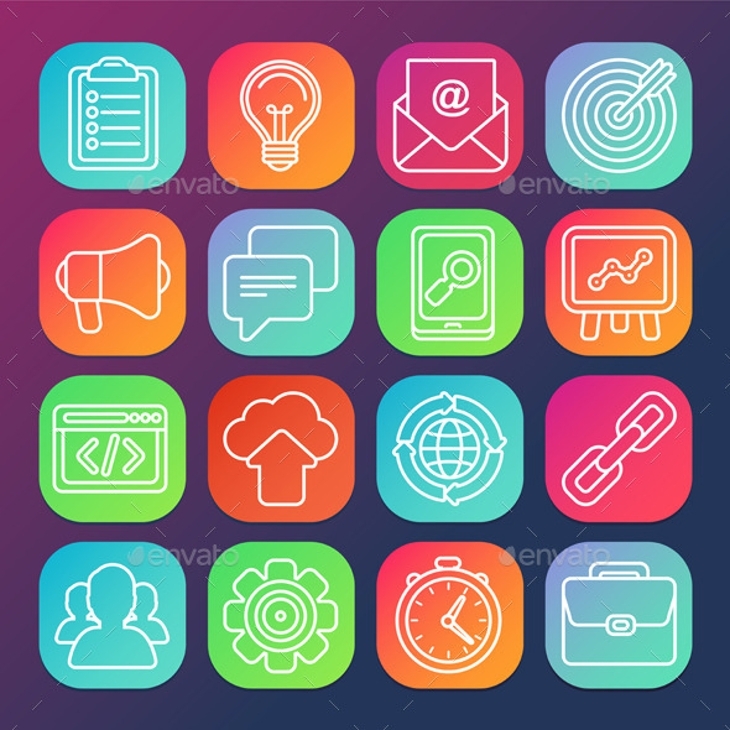 This is definitely a great collection of icons that you will find ideal for use in a wide range of projects including websites, SEO and marketing agency services, presentations, and more. This set features a wide range of icons for modern SEO services, business, promotional materials, illustrations, infographics, marketing, web design, and more. The icons come in different styles that can be easily edited and customized. This pack features a number of impressive SEO icons that can make your projects really eye-catching. The icons come in assorted sizes and styles just to ensure you get the appropriate icon to use in your project. With these long shadow flat icons, your SEO and web designing projects are likely to have a uniquely distinct touch. Plus, these colorful vector icons are fully and easily editable. These icons are likely to take your internet marketing to the next level of success. You will find them ideal for your various SEO services and online marketing. The fact that they are editable renders them customizable. This modern flat design vector illustration features great and fashionable icons that you can use in your SEO marketing related projects. The stylish look of these icons is likely to give your projects a really impressive appearance. 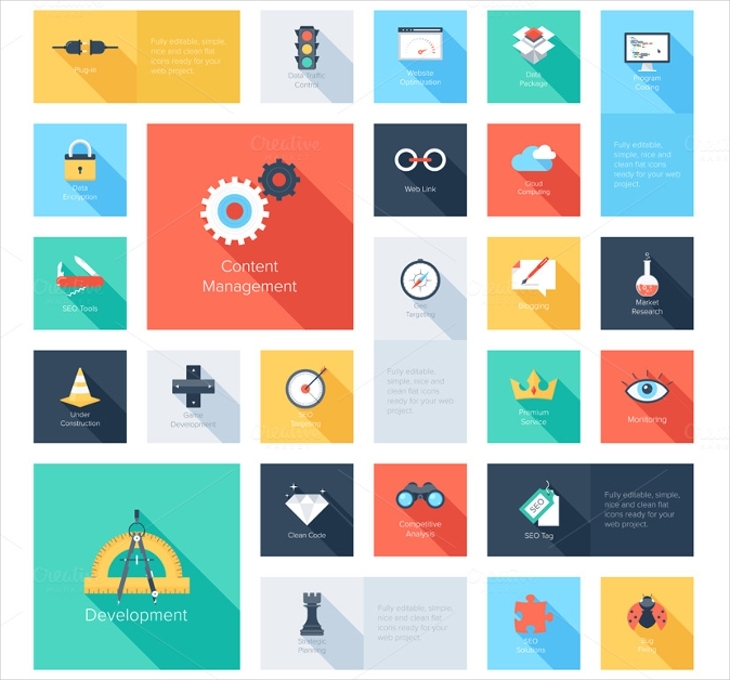 If you are working on an SEO or online marketing project, then you will definitely find this set of icons quite useful. The icons are available in high resolution and different sizes to suit your needs. When it comes to internet marketing and SEO, colorful icons can be a great way of grabbing the attention of your target audience. Thus, using this set of icons in your projects can be very helpful. Your SEO internet marketing project really needs these icons. Since they are fully editable, you can easily customize them to suit the needs of your project. Icons with long shadow come with some spectacular element of elegance that can grab the attention of your target audience. You will find this set of colorful flat vector collection quite helpful in your design projects. With all said and done, it is now time to leverage the power in these icons to improve your website rankings in search engines. With these icons in your toolbox, definitely, your internet marketing strategies will no longer be the same. The icons can help enhance the awareness of your product a great deal. The ultimate result of all these is that you will be able to realize your online marketing goals quite fast and easily. Besides, you will be able to counter your competition and remain atop, something that helps increase traffic to your website, customers and potential customers significantly. Go ahead and make use of these great icons!